3 Strand for our 8" or 10" hanging baskets or pots. 4 Strand for our 12" hanging baskets or pots. 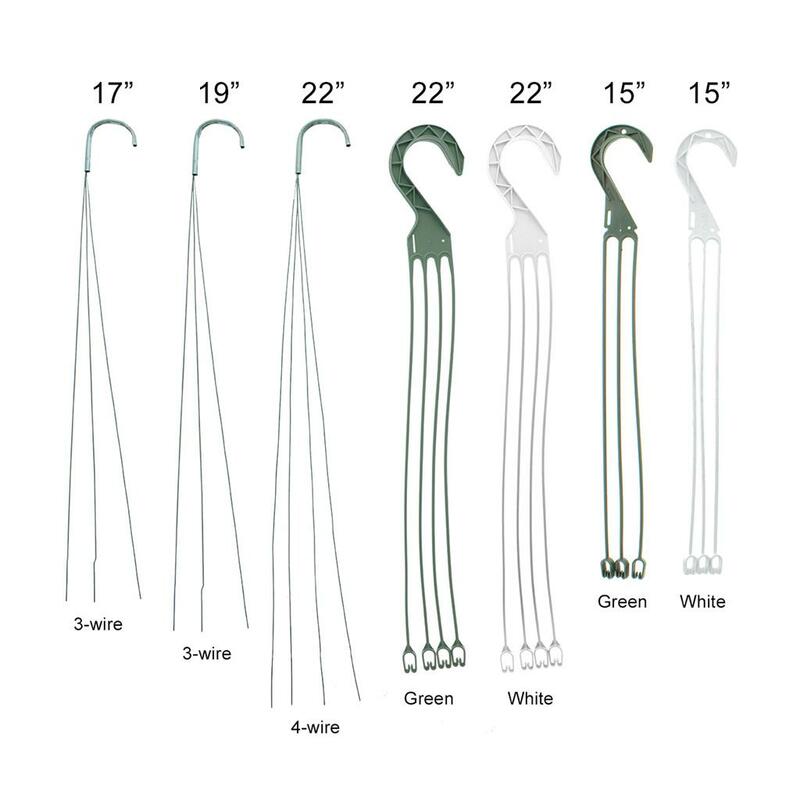 choose an option 3 Strand Green, 15 in 3 Strand White, 15 in. 3 Strand Wire, 17 in. 3 Strand Wire, 19 in. 4 Strand Green, 22 in. 4 Strand White, 22 in. 4 Strand Wire, 22 in. 3 Strand for our 8" or 10" hanging baskets or pots. 4 Strand for our 12" hanging baskets or pots. Just what I needed, great price and excellent service. Well made product, have put most to use already. Recommended. The hangers were exactly what I wanted. They were exactly as described and they are working just fine. The package arrived in plenty of time and great condition . I have no complaints about anything. Everything from product to delivery was top notch. I highly recommend Greenhouse Mega Store. Appreciate the value and quality - would be nice to be able to get a variety pack with some 3 and some 4 wire versions as well as some shorter and some longer wired versions of these hangers - as well as different style 'hooks' at the top. Looked for years to find these hanging plant basket hangers. They work very well, and I am thrilled to have them so that even when the original hanger on a plant basket breaks, I can replace it instead of having to repot my plant. I needed several metal hangers, could not find them anywhere, but found them on your site. Love them, they were just what I needed...I replaced all my pot hangers with them. I will buy them again. Disappointed in product. The description & picture made me think I was getting the same product as I had but was sorely disappointed. What I have is green & a lot sturdier. We bought these as replacements for the basket strands that we had broken. They work just fine and are affordable too. I was very happy I ordered these hangers!!! really like the metal hangers because they can be adjusted to fit wherever you want to use them. Plant hangers work for most part for hanging plants but three have broken just lifting them up to hang. One broke right where the hanger meets the long plastic spoke. The other two broke down closer to the pot. I needed these wire flower pot hangers to fit with my hooks to hang my flower pots. Today the greenhouses use plastic hangers which don't fit into my existing hooks. They work perfectly, thank you! I really like it. very economical and the heightis just how I wanted it. I needed the clip on the basket hangers. There were wire ones on the hanging baskets that broke. I couldn't find replacement ones in a store, and these were perfect. The only available color was brown, would have preferred black, but it works which was the most important! Love the wire handers. The plastic ones that come with hanging pots break too easily and the wire ones last a long time. They can be moved from pot to pot as needed. very high quality material, fit perfectly. The plastic needs to be stronger and thicker. I am still looking for the heavy duty green plastic hanging baskets that I found three years ago. I love these! I can never find small hanging pots so I purchased these wire hangers and I can make any pot that I have into a hanging pot by drilling holes in the sides. It saves me money and it is so easy! Great price and prompt delivery for replacement hanging basket hangers. I have enjoyed decorating the wire plant hangers for my deck. I have beaded a few and they look great! They work fine, but are a little flimsy. Easy to get twisted. This are hard to find in my local nursery, I'm glad you carry them and affordable. Also I like the fact that I can purchase a smaller amount. The shipping was fast, the pots are great. Very very pleased, price was best I had found, and I had done a lot of research. Good Product, Good Quality, Good Company. It is so nice to find a company that will sell to someone who does not have a greenhouse business. I needed plastic hangers for my various hanging baskets. I ordered the 3 strand and the 4 strand plastic hangers and they fit my baskets very well. I will tell you Dillen is one of the companies that makes a few of my hanging baskets and they did fit them, they where a little snug and you have to work with the clips a little to get them to snap on but they will go on you just have to work with them some to get them on and you have to work with them some to get them off. The clips are new so they are stiff but they did take the bending to get them on and off without breaking. The hangers are ITML brand. The basket hangers seem to be very well made and I am very pleased with them. I placed my order on Tuesday and received my order on Friday. I was so pleased to find that my order was shipped usp and delivered to me usp with a tracking number. I plan on ordering from this company again. Plus when I called on the phone to ask questions the staff was so friendly and kind. Over time the plastic gets brittle and they break so having a few spares makes for an easy repair and saves a basket. I have so many hanging baskets that are still in good shape but came with plastic hangers that have broken. I love the durability of the wire hangers. These container hangers are of no use. The ends that are to fit under the lips of pots are too small to use with any of my pots, which vary in size. I would have returned the package, but discarded it before trying out the product. I Love the baskets I ordered the size is perfect and very good Quality. I will order again. I am very pleased with the quality of my purchase and the ease of ordering. Fast delivery and courteous customer service and plusses. Best price I could find without having to order way more then needed. Would do biz with them again. Very pleased with my purchase! I use them for my pothos plants. Very nice! Shipping was quick and pots were packaged securely. Will definitely order from here again! These are exactly what I was looking for. These last longer for me than other plant hangers. The tops are covered for comfort in handling. They are a great value too. All of my plastic pot hangers were breaking. These hangers are perfect for holding even my heaviest hanging pots. 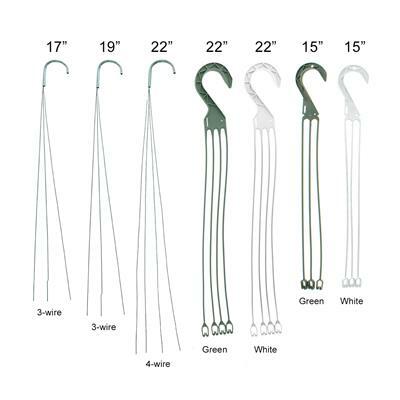 Good price for economical wire hangers. Shipped promptly. Easy to apply since length is marked with wire bend. Just wrap around and twist wire. Quick to attach. Will purchase again. just what I needed to repair some hanging baskets I had. much more durable than the old plastic hangers. Because of space problems in the g'house, we had to hang 5 LRG zuc plants in dbl plastic pots. These did the trick; no worry of falling zucchinis! I'm very happy with your 4-wire hangers. They are well made, sturdy, and sleek looking too. I've been buying my greenhouse supplies from Greenhouse Megastore ever since I put up a greenhouse. 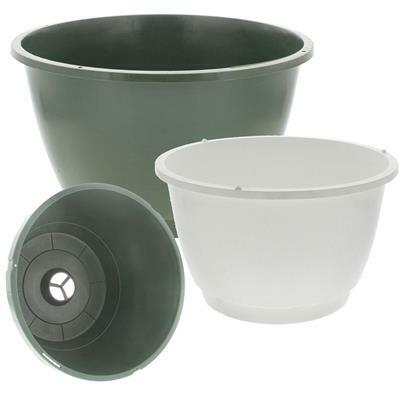 It's a great way to get the pots and trays I need at a reasonable price. And lots to choose from too. You have to be careful when attaching the wires, or the basket will not hang straight. Once my staff got the hang of that, these worked fine. Will buy again. Just what I need. Good quality. Fast service. Thank you! Good products, good service and prompt delivery. My favorite source for garden products. Service and shipping are very good. I would be happy to see a wider range of pot hangers. Orchids have babies (kikis) and hangers for small pots are essential. I'd also like to see much longer hangers than the ones I purchased! I would buy more if you had the products! Great and fast service. Just what I was looking for and couldn't find. Thanks! I recently purchased hanging planters that came with rope hangers. Fortunately I also ordered these Basket Hangers and good thing because all the rope hangers slipped their knots. Wire is always the best choice. Strong, well made and I'm happy. I recently ordered several Centabella pots and matching plastic (4 strand) hangers. The hangers are quite strong and are very easily attached to the pots. I'm not a fan of wire hangers, so it was nice to have the option of wire or plastic. These metal hangers are great! Plastic always breaks and these come with a slight wave where you should bend them so that all come out evenly spaced. Great for new or replacements, easy to use, and at a fantastic price. Quick ship too. I purchased these 3 wire basket hangers to replace the plastic ones that didn't fit through the eye hooks that I had. The wire seems very thin gauge and flimsy. I am hoping that that if we get a windy day the hanging baskets I have do not break them. All items received as ordered and on time. Thank you for your quick service. I am a homeowner with a large property and lots of hanging baskets, which I re-use year to year. These hangers allow me to re-use the pots, but with new hangers, I don't have to worry about breakage. Good product definitely do the job. Great quality and just what I needed for my plants for Mothers Day. 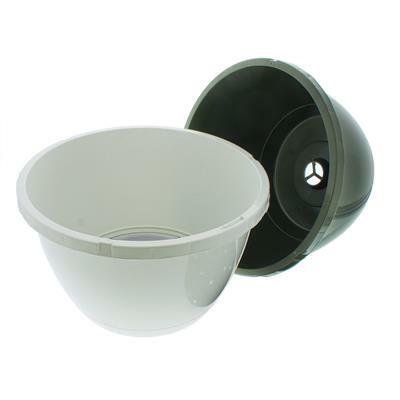 Exelente product, very durable!Better quality than most other products. Good quality and fast service! Will order more as needed. received as described and just what i was looking for. shipped quickly too even though the shipping was kind of high. Great hangers, great price. I have been searching for these for a while. They are sturdy, yet easy to cut to the length that I wanted. The 3 strand white basket hangers were perfect for what I wanted. they fit the 10 inch pots great and secure. my flowers have already concealed the hook and strands beautifully.the price was more than reasonable in fact I plan to up my order for next year. tip, be sure to read the fitments on the sight you will find them helpful. Just exactly what I was looking for - a large capacity at a great cost. I tried to find replacement basket hangers in the big box stores, but some didn't even know what I was talking about. So wonderful to see them in this online store, with choices of color. they came quickly, packaged very nicely. Would recommend this product and Greenhouse Megastore to anyone. I just have a balcony, so really don't have a lot of ground to work with, but I would have no hesitancy to order from this site again. Thanks!! So nice not only to finally find replacement hangers, but have a choice in length!! Some big box stores didn't even know what I was talking about when I asked if they had hangers for flower baskets. Here I had a great selection. And it's a quality product, too-looks like it will last more than one season. Quick shipping, great selection-thanks, Greenhouse Megastore!! I searched & searched the web for basket hangers. Greenhouse Megastore had exactly what I wanted & LESS than the price I expected to pay! Their fast shipping allowed me to get started on my craft project in plenty of time for my craft show! Cant wait to shop for more products with Greenhouse Megastore for the upcoming garden season! The wire s I received from The Greenhiuse Megastore are strong and sturdy and easy to use. Nice baskets and hangers, a pity you can't get them in white. ### After much popular demand, we now have white basket hangers. 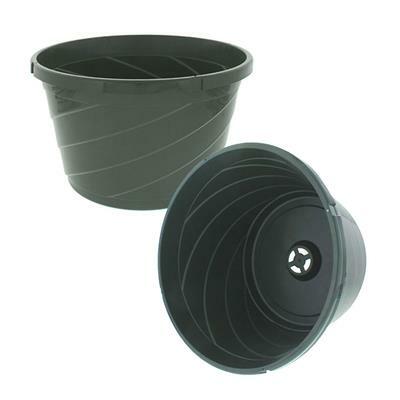 used for 2 and 3 gallon hanging strawberry baskets. Needed heavy support for these baskets and these worked well. For sale at a retail nursery. Just make sure to wrap ends well and you won't have any problems. The quality is good. The wires could have been longer, to bring baskets down. Think 14 inches would have been better - but these are fine. 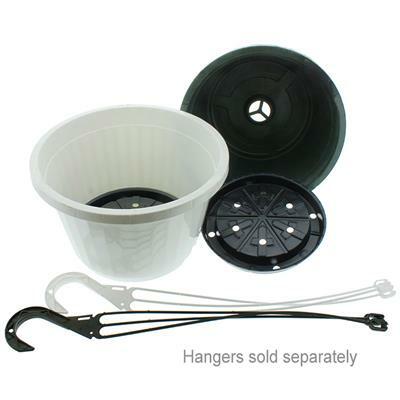 Excellent durable plant hangers to go with the Elite Hanging Pots. Highly recommend. Very good product for the money! Can see buying many more in the future. Very happy with my overall purchase with Greenhouse! Good quality product at the right price. Both my mom and my wife wanted wire hangers. The only thing I could find in our area was the plastic hanger. You not only had the product, but it is amazing in its quality and ease of use. I never thought I would call a hanger elegant, but here it is! I am using these with the Centabella Pots and I could not be more pleased with them. They are sturdy, attach easily and very well and complete the elegant look of the hanging pot. To complete the package, the ease of ordering and fast shipping made this a great experience. Well done! These hangers are actually a lot better quality than what I expected. Very sturdy product, and easy to use. However, like mentioned before, they are a little tough to find! Also, sold in lots of 25, where baskets are sold in lots of 10? This product is just fine, total length being over 21 including the hanger. What gets me is that this essential to most growers is buried at the bottom of nowhere. You have to go to the baskets page. Then at the bottom of that page hangers are offered. Any pictures of hangers are only the plastic ones, and only in the drop-down menu is there any mention of wire hangers. I think advertising for this essential is very poor.